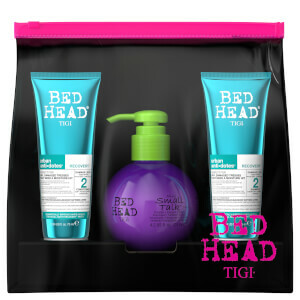 TIGI Bed Head Recharge Conditioner works to transform dull locks by imparting luminous shine for dazzling results. Packed with Sunflower Seed Oil and Lactic Acid, its unique formula protects against UV rays and heat damage caused by styling to reveal healthy-looking, radiant locks from root to tip. A dose of Panthenol adds body and bounce, whilst deeply hydrating and moisturising to prevent split ends, leaving you with replenished, revitalised locks and mirror-like shine. Delivers a refreshing fragrance of sweet orange, lemon, wild raspberry and sparkling grapefruit to uplift the hair and senses. E.N. Massage into wet hair after using shampoo. Water (Aqua/Eau), Cetearyl Alcohol, Dimethicone, Stearamidopropyl Dimethylamine, Behentrimonium Chloride, Fragrance (Parfum), Dipropylene Glycol, Lactic Acid, Potassium Chloride, Amodimethicone, Disodium EDTA, Cetrimonium Chloride, PEG-150 Distearate, PEG-7 Propylheptyl Ether, Phenoxyethanol, Magnesium Nitrate, Ascorbic Acid, Biotin, Niacinamide, Panthenol, Pyridoxine HCl, Thiamine HCl, Tocopheryl Acetate, Methylchloroisothiazolinone, Capsicum Frutescens Fruit Extract, Retinyl Palmitate, Magnesium Chloride, Helianthus Annuus (Sunflower) Seed Oil, Glycerin, Carthamus Tinctorius (Safflower) Seed Oil, Methylisothiazolinone, Lycium Barbarum Fruit Extract, Cyanocobalamin, Folic Acid, Menthol, Amyl Cinnamal, Butylphenyl Methylpropional, Hexyl Cinnamal, Limonene, Linalool. Save up to 40% PLUS receive a FREE TIGI Bed Head Moisturising and Volumising Hair Mini Set when you spend £30 or more on TIGI.